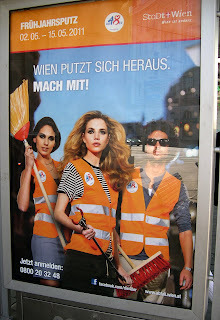 The first sign appears in most of the green areas around central Vienna. It shows a dog with a piece of paper in its mouth. 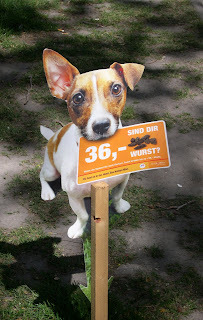 The paper informs everyone that the fine for not cleaning up after your dog is 36 Euro. Included is a picture of some dog residue, surrounded by a question: "Are you sausage (wurst)?" The second sign, below, I first thought was a recruitment poster to attract young hip folks to an exciting career in street cleaning. It turns out that the sign is trying to attract young hip folks to take part in a short campaign in early May to clean the city. I liked my first interpretation better. Last is a picture of a car parked across the street from my apartment. After seeing it, I chose to believe that the city of Vienna had required truck owners to label the different parts of their trucks so that pedestrians would not be confused about which part of it is the front and which part is the back. Of course, the real explanation is much simplier and less fun. It is inexplicable why did I found this truck so funny.